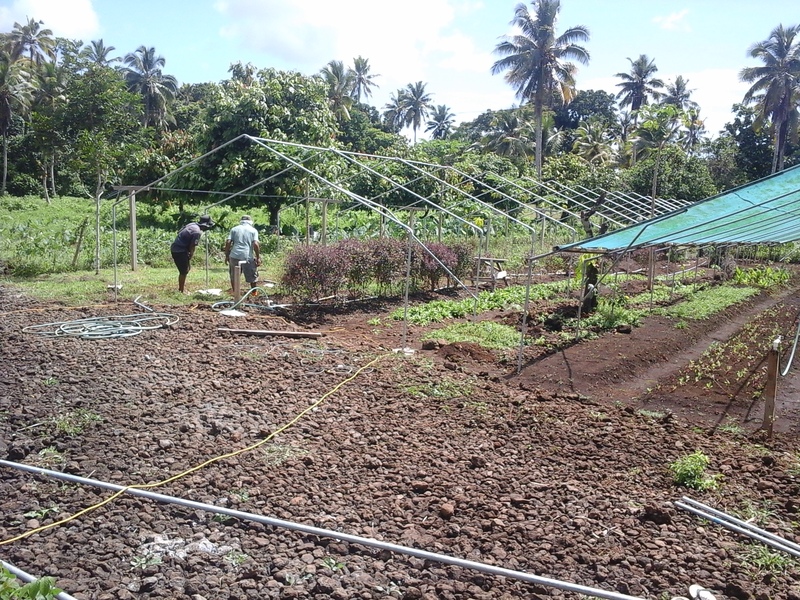 In 2015, the Rotary Club of Wellington partnered with the Rotary clubs of Karori and Apia, Volunteer Service Abroad and the Tindall Foundation to support the establishment of a commercial garden in the village of Lalomalava, Savaii, Samoa. This article is an update on the project from Glenn and Sharyn Cant. the redevelopment of the garden. Once a number of issues were resolved the garden has been producing well, particularly considering the new skills needed to be developed by everyone directly involved in the garden. We spent some of our time working with Roger and men in the garden going over some of the salad greens production techniques, and methods for sowing and transplanting other crops. Roger continues to have overall management of the garden. Alesana, Roger’s son, and his wife Nevi manage the marketing sales, distribution and accounts for the business. They all have other employment and businesses, and do this on a voluntary basis. Without their input the garden would have stopped operating. 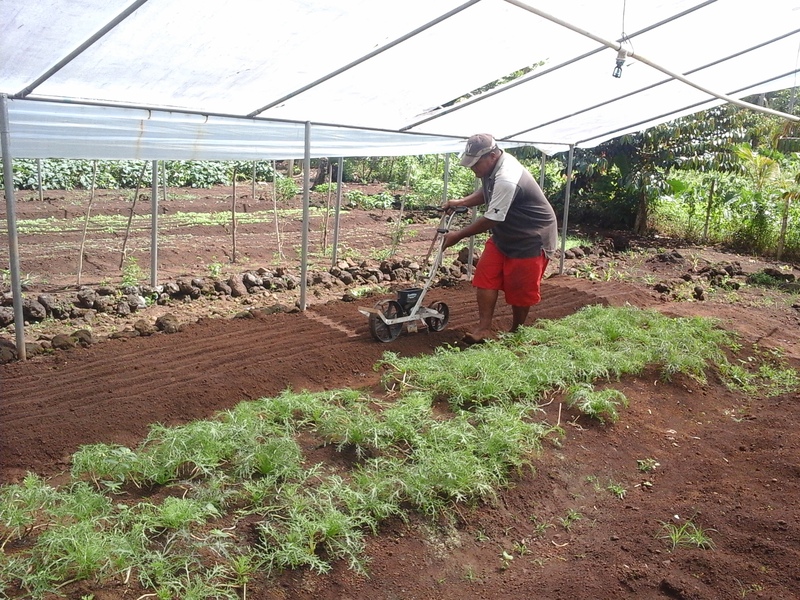 Finding a manager for the garden has proven to be very difficult, which is a problem with many businesses in Samoa, and Roger has been searching for the right person since the garden started. It is proposed that Alesana will manage the garden for the next 12 months with some support from The Tindall Foundation. Roger, Alesana and TTF are currently setting goals aimed at increasing production, expanding the customer base and increasing sales to cover the cost of a manager and improve the financial sustainability of the garden. The green houses that were put up just over two years ago need the plastic replacing because the plastic didn't have the necessary UV stability causing degradation of the plastic. The plastic should last at least 3 times longer than this, and I was assured that it was good quality when I purchased the green houses. Roger has purchased some more plastic, costing $2500 Tala, but it isn’t wide enough to completely cover the houses and there are no guarantees this is any better and will last any longer. Since our last visit there have been a number of new developments in the garden. Firstly a water reticulation system has been installed. This uses water from the village to supply the garden, meaning that the garden will not run out of water and the future development of the garden won't be limited by water. 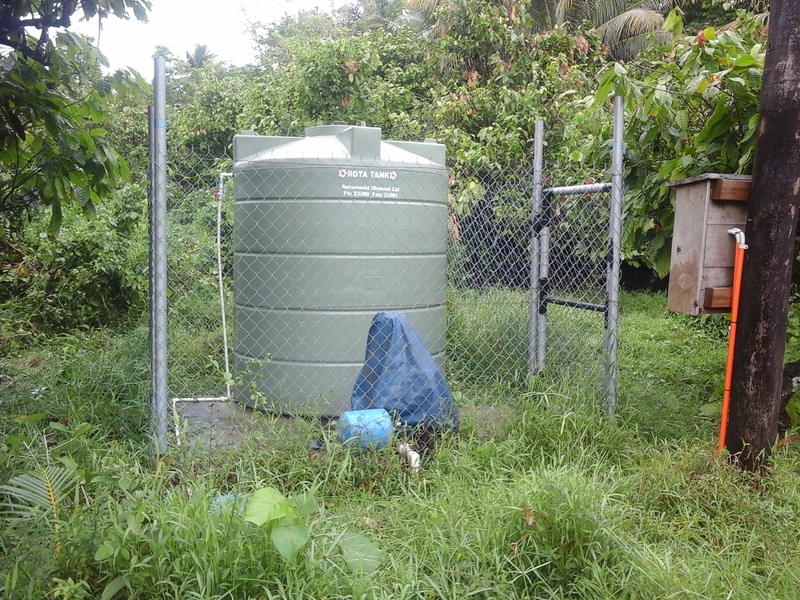 The system included the installation of a power supply, water meter, water pump, water storage tank and approximately 900 metres of pipe to the garden. Large gates have been installed at the entrance of the garden. As theft of certain crops is a problem, these gates will make the garden more secure. A family is now living in the fale next to the garden, and in exchange for free power they provide some security for the garden. Another greenhouse is currently being built by local men using the same design as greenhouses previously built. We brought over more irrigation sprinklers from NZ in December for the new greenhouse and some future expansion. The current customers are Amoa Resort, Jet Over Resort, La Legato Resort, Lucias, Savaii Lagoon Resort, Savai'ian Hotel, Stevensons Resort and a few private customers. Alesana (Rogers’s son) is doing the marketing, sales and deliveries. He does this twice a week when he is delivering meat to resorts. Alesana grows, processes and sells beef from the family farm. With regular production over the last 3 months, sales have averaged $500.00 Tala a week. These sales have been at the tail end of the main tourism season and sales have been limited to the areas Alesana delivers his meat to. Lata Estate continues to be the main competition and could be having a significant impact on sales. We discussed the possibility of selling product to The Sheraton near the airport. They are potentially a significant customer and Roger has spoken to the chef who is interested in buying, however Roger is hesitant to supply until they can consistently produce a quality product. We met with Nive (Alesana's wife) and discussed LDT accounts. All the handling of cash, inputting data onto the accounting package (MYOB) and banking etc is done by Nive. She said she would prepare an accounts report which will be prepared for TTF and other donors. We discussed the need for the accounts to be audited. It has previously been agreed that Arthur Penn (accountant in Apia) could audit the accounts and make any recommendations about how the accounts should be prepared for an organisation such as LDT. We also reminded Roger and Nive that TTF had offered to pay for the accountant’s fees in this phase of the development of LDT and emphasized that donors would appreciate getting an audited set of accounts which would also prove useful in any future funding applications. Nive also doesn't get paid for the work she does for LDT and as she has a full time job and a young family it may be necessary to employ someone in the future if the garden expands. There are 2 employees in the garden, who are each paid $90 Tala for 20 hours work per week. This is well above the average wages paid in the villages. These men are learning many new skills and taking on responsibilities they otherwise wouldn't have. Currently other work is being done in the garden by men from the village which includes building large entrance gates and constructing another greenhouse so that the production and range of crops can be increased. And for the first time LDT has used profits from the garden for the direct benefit of the village. LDT has donated $8000.00 Tala towards the construction of a Peace Corp worker home. This person will be teaching at the Lalomalava primary school which services 3 local villages. This is a combined village project with money and labour being donated from all the local villages. We discussed that LDT trustees should make sure that people of the village know that this donation has been made (through Matai and Women’s committee meetings) as some negative comments about the garden and how it is run have been made by some factions in the village in the past. 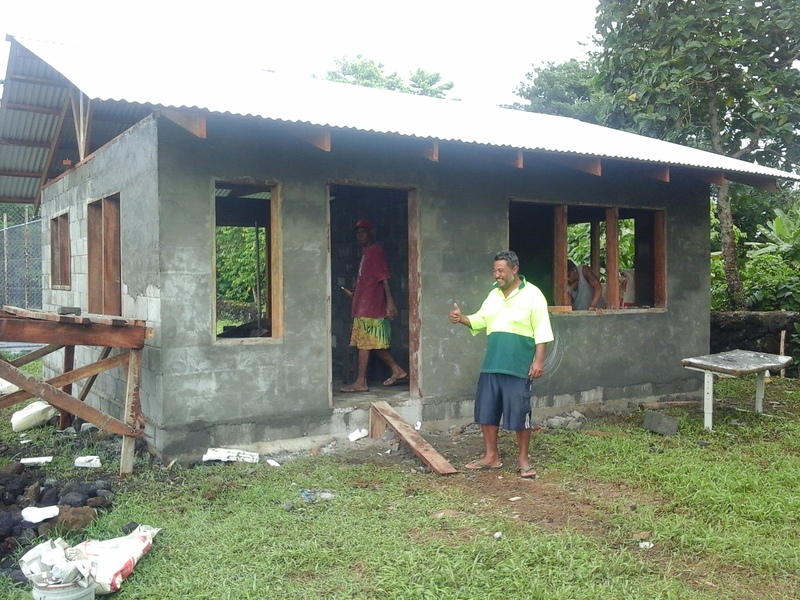 Nive made the suggestion that a sign should be made, and put on the new building that acknowledges the organisations that have supported Lalomalava gardens/LDT (ie TTF, VSA and Rotary), and how LDT has partially funded the Peace Corp house. This signage could be possibly something that TTF would fund. We had a brief meeting with Afoa, the high chief of the village. Afoa was happy with how the garden is running and is keen for people to replant cocoa and coconuts and said he would present his idea at the next village meeting. We have heard recently from Roger that soon after our visit in December Afoa became unwell and sadly died. Overall, we came away from Lalomalava feeling very positive about how the garden was going, but aware that Roger and his family’s management of the garden are key at present. 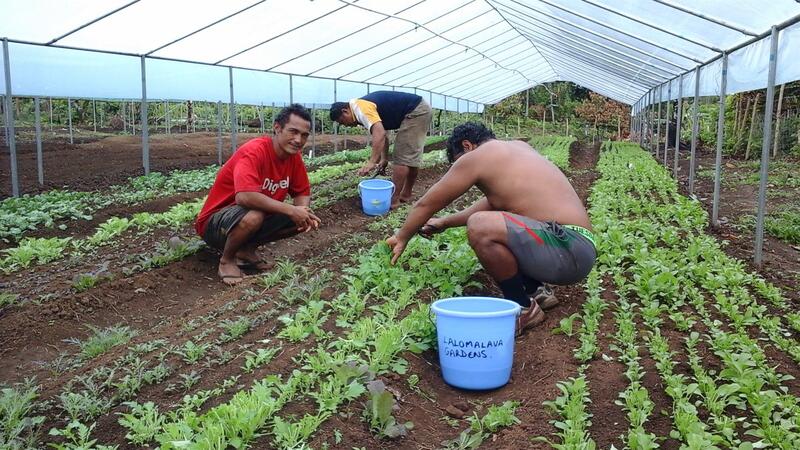 As mentioned , finding the right manager for any business can be difficult in Samoa, and this is particularly so in the villages, and it remains one of the gardens biggest challenges. With Alesana taking this role for the next 12 months ensures the skills needed to operate the garden will be maintained in the village, and the increased production and sales should cover the costs for a permanent manager when one is found. Original generation time 1.5475 seconds.